I actually took this picture a few weeks ago when buzz was filling up specktra about this collection....I really really liked the promo pic and was inspired to do a look using permanent line colors. Looking at this pic now makes me realize that I could probably done without submarine e/s as it can be easily duped by freshwater e/s or blue calm e/s (pro). However...the red lipstick I used (classic dame) just isn't the same as the Port Red lipstick from the Naughty Nauticals collection...it lacks that extra frosty effect. 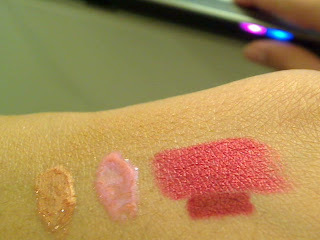 Here are swatches of the lip products: from left to right, bateaux l/g, love knot l/g, port red l/s, and brick red liner. The liner is not part of the collection but it's a great one to match...too bad the camera didn't pick up the blue reflective quality of the love knot lipgloss...it's gorgeous! Next are the e/s and pigment swatches. Top left to right: submarine e/s and meet the fleet e/s. Bottom left to right: mutiny pigment and shore leave e/s. 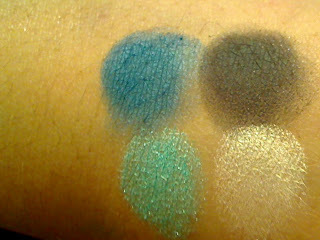 Mutiny pigment is definitely the star of these four...there isn't really a color on the MAC line similar to it. Also, I was suprised how much I liked shore leave...it's such a pretty shimmery cream color with a great smooth texture. Can you guess which one is submarine e/s? It's on the top left. 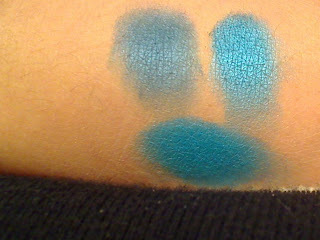 Next to it is freshwater e/s and below is blue calm e/s. You can see that it's a little darker than the other two but I think you could carry off the same effect with either of the three. 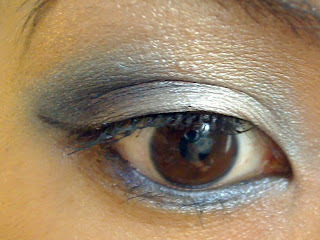 This is a look I did last Thursday using the collection. For real this time! 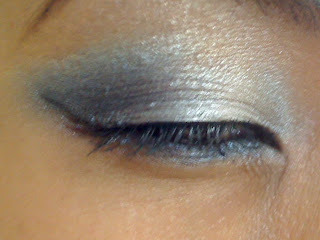 I mainly used shore leave, submarine, and meet the fleet eyeshadows. I then used Port Red lipstick and Brick lipliner. 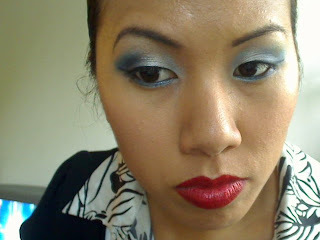 It's a pretty dramatic look...blue eyes and red lips? You kind of have to be a little brave to wear it. 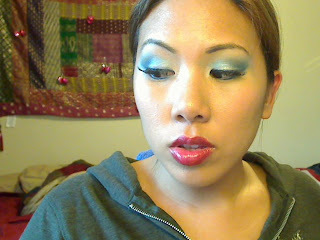 I haven’t quite decided if this is the look I’ll be doing for my tutorial quite yet. But in the meantime, I thought I’d post anyways! The lightning in my new apartment is a lot less yellow so many have said that colors show up more true to life. Hopefully this will be better for you guys! Look how gorgeous this lipstick is! 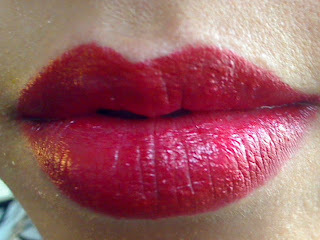 The key to a great red lip is to take your time in lining your lips with a matching red lipliner. Lastly, I posted this video Thursday or Friday to my you tube page. It’s a quick video on my Naughty Nauticals Haul. Overall, I do think this collection has some nice products for everyone. It’s not exactly something to get Hype about…I think I’m more looking forward to Cool Heat and Neo Sci-Fi. 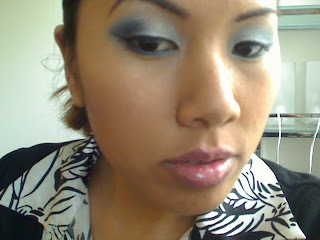 In the video, I’m rocking my super faded makeup that the MUA did for me at M.A.C. It looks kind of crazy in the video, lol, but it had been a long day! Both are HOTT looks for a night out with the girls!! my sis is so damn hot. love it. hehe. :) i always love the looks that you come up with! lurve: i knowwww i love this red lipstick! chris: thanks sweety! my sis is hot too! woot! Looking good! Damn that blue looks good, wish I could carry it off. i'm expecting my naughty nauticals haul to arrive in the mail today!! wooohooo!